Today we are doing the last day of the Blogging Marathon Edition 10. Can’t really believe another seven days simply flew! I really enjoyed doing this edition as I did two of my favorite themes. Of course all themes are my favorite. However sharing my lunch box has always been an interesting thing for me. So I really enjoyed this week. After raining cats and dogs, it’s much better today. Though kids weren’t happy that it didn’t rain, they waited with batted breath to know if the schools were declared holiday again. The most funny thing was, Chinnu refused to wake up and Peddu tells me the trick to say that there is no school today. The moment I said that, Chinnu actually woke up and came up. But on seeing the polished shoes, he refused to budge. It was really so funny to see them doing these things. Though we failed to understand how they will keep themselves occupied at home. Anyway today’s recipe is going to be another version of Sambar. I was thinking, it’s been an ever flow of different Sambars at home. I really tired of making only sambars. I must really be more innovative I am sure. I hope I haven’t bored you guys by sharing so many versions of sambar, but trust me, each one comes out differently and very delicious. Especially when paired with the Plantain Roast that was made, the combination was deadly. I remember this variety of Banana Roast being always seen in my friends boxes. Amma usually makes the other versions, with this being on rare occasions. I decided to make this for lunch. Tamarind Water or Tamarind paste – 2 tsp mixed in 2 cups water. Wash and pressure cook toor dal with turmeric and few drops of oil. Once done, keep it aside. Dry roast methi and powder it. Keep this aside. Heat a pan with oil, do the tempering with all the seasoning ingredients. When the mustard pops, add the chopped onions and green chillies. Then add the tamarind water, sambar powder. Bring to boil. When the water is boiling, add cooked dal, salt, asafetida powder, fenugreek powder. Add chopped tomatoes. Continue boiling for about 5 to 10 minutes and stir occasionally . Add fresh Coriander leaves. Serve with steaming rice and papad. If you want you can roast fenugreek in more quantity and store it. Vegetables can also be used in this sambar. Wash and peel the outer skin of the bananas, soak in water as you continue chopping. 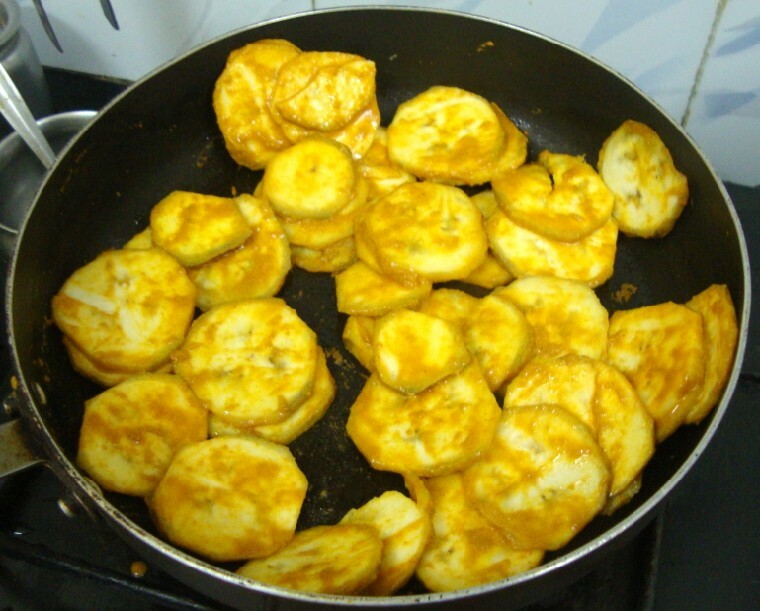 Once both the bananas are chopped, drain it well and mix with all the ingredients and marinate for 10 mins. Heat a non stick pan and grease with 1 tsp oil. add the mustard, Urad dal and curry leaves. 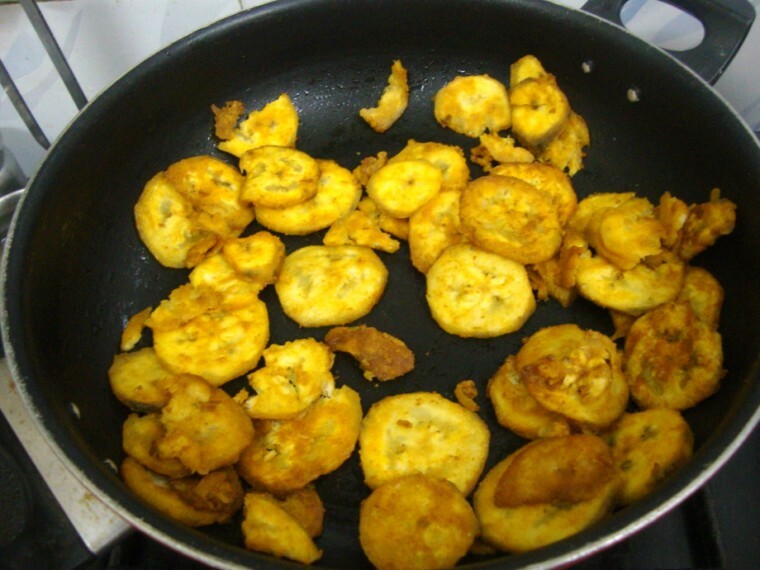 When the mustard pops, add the marinated plantain pieces. Sprinkle oil little by little and keep stirring. 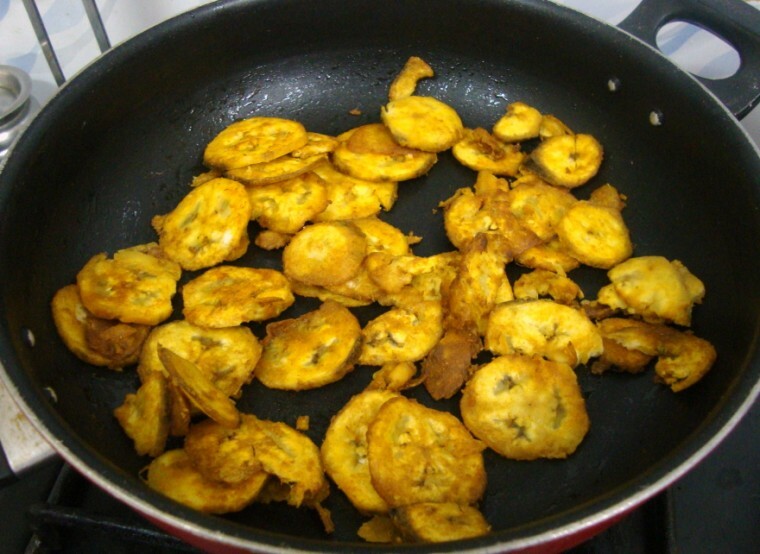 This takes about 15 – 20 mins for the plantain to get cooked and crispy. It was wonderful having you all join me, will look forward to another session of Blogging Marathon. Sambar and this roast,one of my fav combo,makes me hungry. 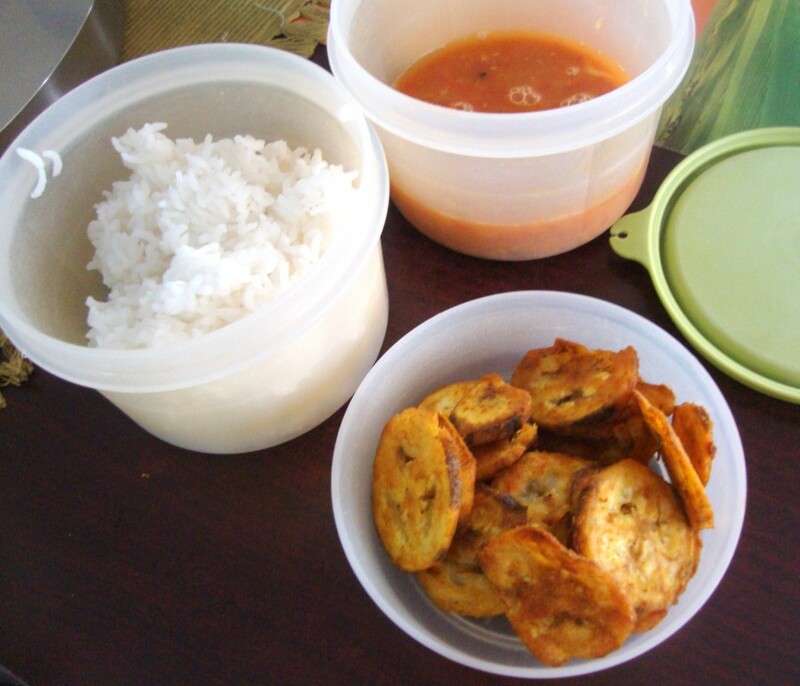 Yummy fry and a perfect combo for sambhar. LOVE that banana roast, one of my all time favorites. Combo with the sambar is just perfect. Enjoyed all your lunchbox posts Valli. Thanks for organizing yet another successful BM. Looking forward to the next one. Oh my .. we make this roast similarly too. Love it with sambar. that vazhakkai roast is making me hungry…a very satisfying meal. Vazhakkai roast and sambar are truly a lovely combo. We roast it plain. 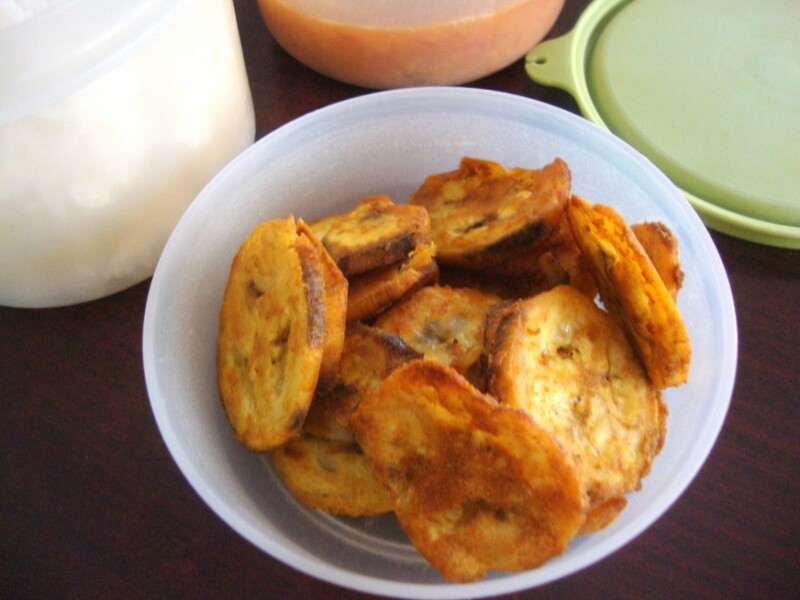 Love your interesting additions to the plantain roast. As usual it was an interesting marathon, Valli. If there is one dish that I can't seem to master its got to be this one! So I will go ahead and bookmark this and do a ditto of it! I am going to try that roast next time for sure! Looks absolutely yummy. And my son, he is a weird kid. He loves going to school (not surprising given that he is an only child! ).